Location/Climate: 120 miles south of Juneau, 120 miles north of Ketchikan. 106"/yr. precip., 27°F56°F. Population: 3,350 (10.4 percent native). Travel Attractions: Access to Petersburg CreekDuncan Salt Chuck Wilderness, road access on Mitkof Highway (AK 7) to Forest Service roads (logging) and kayak put-ins, Wrangell Narrows ferry route. Getting There: Scheduled ferry from Juneau, Ketchikan, and other points; scheduled air service from Juneau and Ketchikan. Information: Chamber of Commerce, P.O. Box 649, Petersburg, AK 99833, 772-3646, chamber@petersburg.org, www.petersburg.org. A working town, Petersburg is rich in Norwegian heritage. It is named after Peter Buschmann, who arrived in Alaska from Norway with his family in 1891, settling finally at the northern end of the Wrangell Narrows in 1897. Others followed him to this new home that must have reminded many of the fjord lands of coastal Norway. The town is at the northern tip of Mitkof Island, most of which is part of the Tongass National Forest. Scandinavian heritage is visible in the style and manner of the community and embodied by the 1912 Sons of Norway Hall on Nordic Drive. Today Petersburg is a fishing and lumbering town. 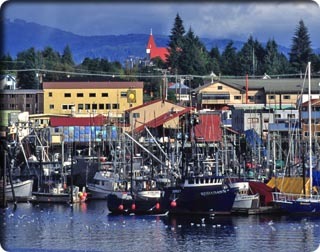 The harbor is home to Alaska’s largest halibut fishing fleet and four seafood processing plants that handle over 113 million pounds of fish and shellfish annually. Eagles are commonly seen in town and along the Wrangell Narrows, and active nesting sites are accessible by road. An extensive network of Forest Service roads built for timber harvesting reaches most areas of Mitkof Island. Most can be accessed via the 34-mile Mitkof Highway (AK 7), which runs south from Petersburg along the eastern shore of the Wrangell Narrows, then eastward to Blaquiere Point at the island’s southeastern tip. Vehicle travelers and cyclists may enjoy utilizing the extensive road network for exploration. A map of Petersburg, available through the chamber of commerce, offers information on viewpoints, trailheads , fishing, picnicking, and other opportunities found on or near the roads. Access to the trails, cabins, and watercraft routes of Petersburg CreekDuncan Salt Chuck Wilderness involves a short crossing from town to Kupreanoff Island. Inquire at the ferry terminal or small-boat harbor regarding cheap shuttles. Kayakers planning to explore the Stikine River and south end of the Stikine-Leconte Wilderness can put-in at Blaquiere Point for best access. Horn Cliffs, Leconte Bay, Leconte Glacier, and the northern end of the wilderness area can be accessed via Frederick Sound right from Petersburg. See the appendix for outfitters, rentals, and drop-offs. Clausen Memorial MuseumStep in if only to see the world’s largest king salmon, estimated at 126.5 pounds, and the world’s largest chum salmon, which weighs about 36 pounds. Local heritage items are on display. 203 Fram Street (at Second Street), 772-3598, bigfish@clausenmuseum.alaska.net, www.clausenmuseum.alaska.net. Open Monday through Saturday in summer, 10 a.m. to 4:30 p.m. Check with the museum in winter. Bed & Breakfast listings, Several B&Bs in or near town, current list found HERE. Harbor Day Bed-and-Breakfast, 404 Noseeum Street, 772-3971, www.alaska.net/~harbrday, harbrday@alaska.net. Two rooms in home with shared bath, good town access. NOTE: Harbor Day has been reported to be out of business. Confirmation underway. Ohmer Creek National Forest Campground, Mitkof Highway (AK 7), 22 miles south of town. Nice sites, near Blind Slough and access to the south coast. Petersburg Bunk and Breakfast Hostel, 805 Gjoa Street 8 blocks east of waterfront), 772-3632, info@bunkandbreakfast.com, www.bunkandbreakfast.com. 2-4 prson rooms, shared bath, kitchen, continental breakfast. $25 per bed. Scandia House, 110 Nordic Drive right downtown, 772-4281, (800) 722-5006, scandia@alaska.net. New hotel, luxury suites available36 rooms, courtesy van to ferry, harbor views. $90 to $175. 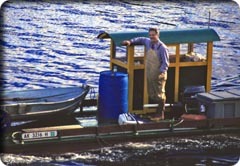 Tides Inn, First and Dolphin Streets, 772-4288, tidesinn@alaska.net. Motel, cable TV, kitchenettes, continental breakfast, downtown, courtesy van, view rooms. $70 to $85 a night. Coastal Cold Storage, 306 North Nordic, 772-4171, coastal@alaska.net. Seafood Deli, fresh seafood cooked to order. Helse Cafe, Sing Lee Alley and Goja Street, 772-3444. Health food and deli offerings, lunch only. Joan Mei Restaurant, 1103 South Nordic Road, 772-4222. NOTE: Currently for sale by owners. Future unknown. Northern Lights Restaurant, across from Sons of Norway Hall, 772-2900. Seafood, steaks, pasta. Waterfront dining. Pappa Bear’s Pizzeria, Nordic Avenue (Mitkof Highway), 772-3727. Across from the ferry terminal.